Is your blog pretty empty in the comments section? Are you looking for a simple, yet fun way to increase engagement? Many bloggers struggle with getting their audience to respond to their posts, and often want to know the secrets to getting blog comments. What if you could ask questions to go along with your blog content and have your audience answer them? 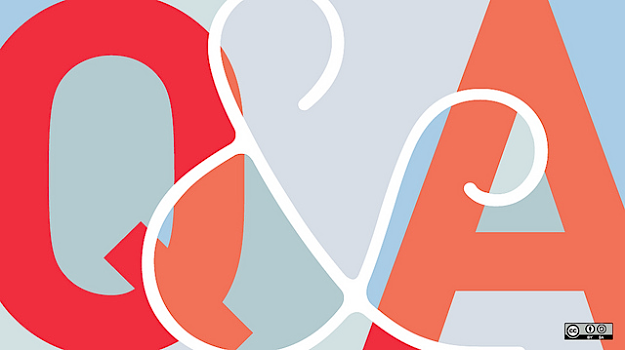 What if your readers could ask questions as well for your audience to answer? Simple questions may just be the key to increasing engagement on your blog. Plus, the more answers you receive, the more you’ll know and understand your audience. If this all sounds great to you, I want to introduce you to a WordPress plugin and conversational tool called Urtak. This tool is definitely not for everyone, but if you’re looking to bring a little more life to your blog then it’s definitely worth trying out. It also doesn’t hurt that “Urtak users spend 90 seconds more time on articles or videos”, making it a great tool for reducing bounce rate as well. After installing the Urtak plugin, you’ll see a message at the top of your blog’s dashboard letting you know that you’ll either have to sign up or login to your account. Don’t worry, sign up is done right from your dashboard, so you won’t have to leave your blog. The only thing you need to sign up is your email address. Once signed up you’ll be directed to Urtak’s settings area. Urtak can take over as the main form of conversations on your blog if you choose. Meaning, you can disable your blog comments and only display Urtak. This may not be a good fit for certain niches because your readers won’t be able to leave feedback or compliments, so be sure to choose wisely. I like that you can display the number of Urtak responses on your blog with the addition of a PHP code (via your theme editor). This is just like displaying the amount of comments there are on your posts. You can choose between two different moderation levels: community and publisher. This is nice because you can choose whether to be strict with the questions asked by your audience, or a bit more lenient. Community moderation requires little to no effort. 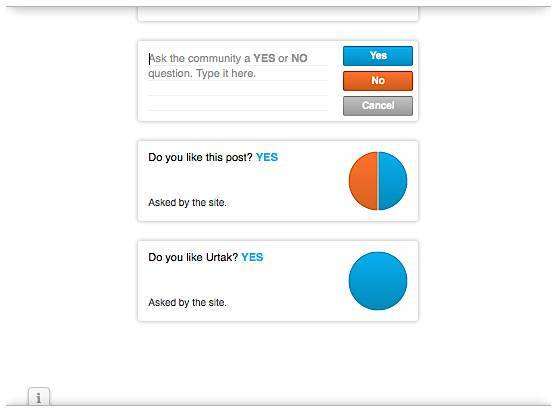 All questions will be approved automatically and Urtak will use its smart algorithm to get rid of the “bad” questions. On the other hand, publisher moderation gives you full control over the moderation of added questions; you’ll get notifications so that you know when new questions are added and you’ll have to approve them. Another thing that you have control over is the placement of the Urtak widget on your blog. You can choose to have it load right at the end of your posts or you can insert the code manually. This gives you a chance to be creative with the placement. By default the Urtak widget will not display on the home page, but you can change this. Also, if you’d rather not have your readers add their own questions, you can disable that feature here. It’s obviously a better choice for your blog if you give your audience the chance to add questions, but at least the option to disable it is there if you don’t want it. Along with Urtak’s settings, there’s an Insights area where you can see useful stats related to Urtak like: total responses, total Urtaks, total questions, responses today, pending questions, most agreed on, most cared about and most divided. This information can be great for market research or just for getting a better idea of what your readers are interested in. After you have Urtak’s settings the way you want, the next step is to start adding questions. You’ll notice that in the post editor, there will now be a new section called Urtak. This is where you can add questions and keep up with responses related to that post. You can sort and search through the questions and even hide Urtak on a post-by-post basis. When you ask a question, the only stipulation is that it must be a yes or no question. This is why disabling your comments in favor of Urtak may not be such a great idea. Once you type in your question, you must also answer it yourself by clicking yes or no. Once you do, your question will be added and you can type in a new one above it. If you’ve kept the option for your readers to ask questions enabled, you won’t have to do anything special; it’s automatically included in the Urtak widget. 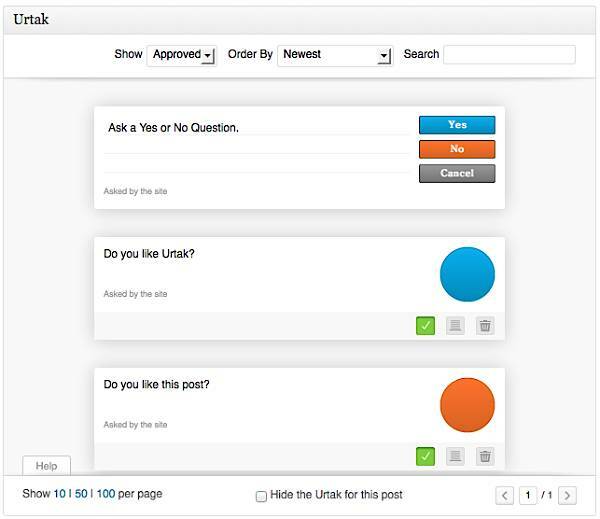 To see Urtak in action, go to a blog post and you’ll see your first question displayed. The next question will not show up until the first one has been answered; then it will show above the previous question. Once all questions have been answered, you’ll see a spot for your readers to enter their own questions. They’ll need to sign into their Urtak account if they have one, if not they’ll be prompted to sign up before they can ask their question. This is one drawback to Urtak because some people may not want to sign up for an account. However, to make sign up even easier Urtak allows sign up via Facebook or Twitter; most of your readers are sure to have one account or the other or even both. When I first came across Urtak, I thought that it was an extremely useful blog tool – and I still do. Even though it is pretty limited since you can only ask yes or no questions, it’s a great addition to any blog looking for a boost in activity. 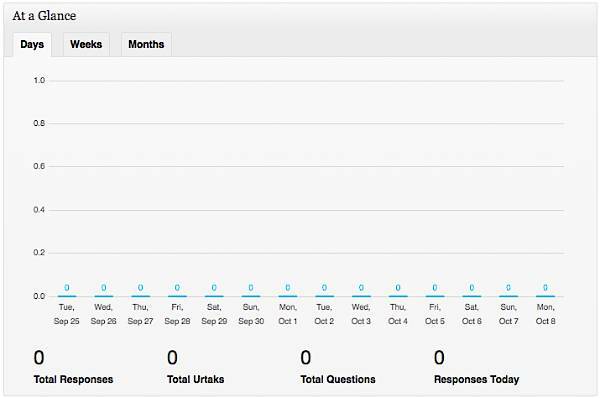 Luckily, your audience won’t need Urtak accounts to answer questions, just to ask them. So while this may stop some from adding their own questions, it makes it easier for them to interact and answer questions. Do you think that Urtak is a good tool for increasing engagement on your blog? Do you feel that your readers will enjoy and use Urtak? Would you disable your comments in favor of Urtak? Let us know in the comments. There’s lots of different comment tools out there so you never know what works best until you try them out.